(Nanowerk News) Thermal ablation with magnetic resonance-guided focused ultrasound surgery (MRgFUS) is a noninvasive technique for treating fibroids and cancer. New research from UC Davis shows that combining the technique with chemotherapy can allow complete destruction of tumors in mice. MRgFUS combines an ultrasound beam that heats and destroys tissue with a magnetic resonance imaging to guide the beam and monitor the effects of treatment. The effectiveness of the treatment can be limited by the need to spare normal tissue or critical structures on the tumor margins, as well as the need to eliminate micrometastases. In a new paper in The Journal of Clinical Investigation ("Ultrasound ablation enhances drug accumulation and survival in mammary carcinoma models"), Katherine W. Ferrara, distinguished professor of biomedical engineering at UC Davis, and colleagues report on a strategy that can destroy an entire tumor without thermal destruction of the tumor margin. Her group demonstrated a dramatic increase in the concentration of anti-cancer chemotherapy within several types of MRgFUS thermal ablation-treated tumors. "MRgFUS is already FDA approved for the treatment of uterine fibroids and palliation of bone metastases. We hope to expand the indication for MRgFUS by supplementing it with chemotherapy," said first author Andrew Wong, a graduate student with the UC Davis Physician Scientist Training Program. Ferrara's previous research has shown that ultrasound-induced mild hyperthermia can enhance the accumulation of tiny nanoparticles carrying anti-cancer drugs, but the accumulation is dependent on the type of tumor. Her group hypothesized that combining thermal ablation and chemotherapy could improve efficacy across multiple types of tumors. 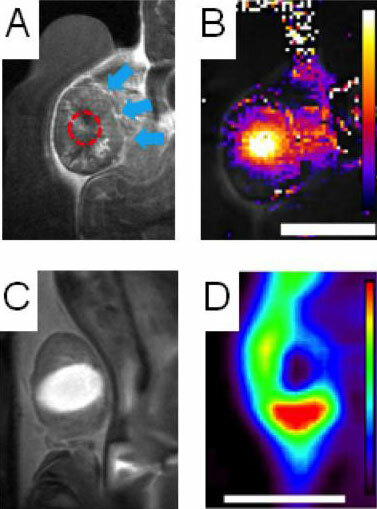 The team used a variety of techniques including combined positron emission tomography/computed tomography (PET-CT), magnetic resonance imaging, autoradiography, and fluorescence imaging to track nanoparticles loaded with the chemotherapy drug doxorubicin in a mouse model of breast cancer. They found that as the ultrasound damaged the tumor and induced a local immune response, nanoparticles accumulated in the tumor and the local drug concentration increased 50-fold. The high drug concentrations continued over several weeks, increasing total exposure of the tumor to the drug. Ferrara's research team found that the enhanced drug accumulation induced by MRgFUS resulted in improved survival and a consistent cure in their preclinical model of breast cancer, even when part of the tumor was left intact. They also demonstrated that an effective cure could be achieved with a carefully designed protocol involving heat-activated nanoparticles, which, when gently heated by ultrasound, release their chemotherapeutic payload in the vasculature surrounding the tumor.